ProVal fails to start. The windows hourglass appears and then subsequently disappears. An incorrect path is specified for the “SplashBitMap=”, “Initial Workspace=”, and “ADF=” settings in the [CONFIG] section of proval.ini. To remedy, remove the “Initial Workspace=” and “ADF=” lines (these were made optional starting with version 3.01), remove the invalid paths (leaving the file names), or correct the paths. Access to the application files may be denied due to incorrect network permissions, which may prevent ProVal from starting correctly. This is typically an issue in network installations. Access levels must be corrected to remedy this situation. 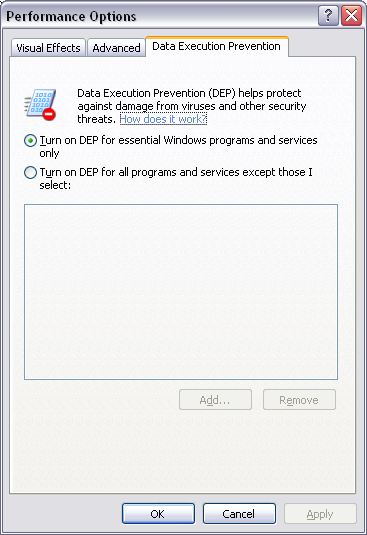 There are three possible causes – invalid paths, access to the application files is denied, or Data Execution Prevention (DEP) prevents program execution.